“..God who gives life to the dead and calls into being things that were not.”(Romans 4:17, NIV). “You will make your prayer to Him, He will hear you, And you will pay your vows. You will also declare a thing, And it will be established for you; So light will shine on your ways”. (Job 22:27‭-‬28 NKJV). “I will declare the decree: The Lord has said to Me, ‘You are My Son, Today I have begotten You. Ask of Me, and I will give You The nations for Your inheritance, And the ends of the earth for Your possession”. (Psalms 2:7‭-‬8 NKJV). “And in that day you will say: “Praise the Lord , call upon His name; Declare His deeds among the peoples, Make mention that His name is exalted. Sing to the Lord , For He has done excellent things; This is known in all the earth. Cry out and shout, O inhabitant of Zion, For great is the Holy One of Israel in your midst!”(Isaiah 12:4‭-‬6 NKJV). Remember, you’re going to get what you call in to your life. You have creative power in your words, and you are prophesying your future. Declare what God says about you , that you are blessed. and said, “Assuredly, I say to you, unless you are converted and become as little children, you will by no means enter the kingdom of heaven. “Assuredly, I say to you, whatever you bind on earth will be bound in heaven, and whatever you loose on earth will be loosed in heaven. “Again I say to you that if two of you agree on earth concerning anything that they ask, it will be done for them by My Father in heaven. For where two or three are gathered together in My name, I am there in the midst of them.”(Matthew 18:3‭, ‬18‭-‬20 NKJV). +The WORD of God in us is Alive, Active, Operative, Energizing and Effective. It is capable of producing all the intents and purposes of God in us and through us. +When we take man made medication we have no issues expecting the intents and purposes that man made medication is supposed to produce. +How much more then shall we expect the Word of God to produce in us the intents and purposes of God in our lives. +Remember what Jesus said in Matthew 4:4. Man shall not live by bread alone but by every Word proceeds of the Mouth of God. •Continue to let the WORD of God be the standard for your life. Always LOVING others like Christ Jesus Loves us while keeping our Faith, Trust, and Confidence in Him. 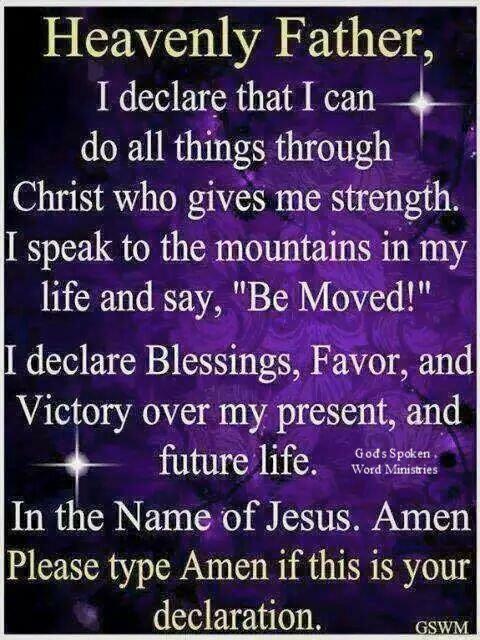 This entry was posted in Daily Message and tagged call it into existence, decree and declare the word, SPEAK THE WORD.